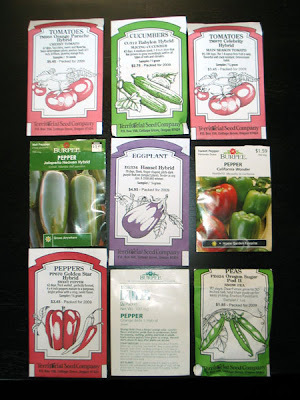 The orange pepper, the jalapeno and the red/green pepper are seeds I kept from last year. I like the orange pepper so much that I think I'll plant it every year. This is my second year with a veggie garden. There were a few things that didn't make the cut for a second year such onions, beets, and pumpkins. I don't have much space either (well I could have more space but that would be a discussion with hubby about tearing up more lawn! LOL). I considered buying more containers this year, but being new at this I felt like I didn't maximize the potential of the ones I already had so that plan was put on hold. Maybe next year. I can't wait to see how the roof takes shape. Your seed selections sound great. you should happily be eating from your rooftop in no time. What a view! I usually grow a green jalapeno, but this year I decided to mix things up and am trying a yellow jalapeno. I haven't tried growing bell pepper in containers. I wonder if there are miniature varieties that would work on my balcony... Cheers! Last year I planted the miniature "Golden Baby Belle" from Burpee and they grew very well in containers. In fact they grew too well, I should have grown just 1 plant not 2, by the end of the season I wasn't sad to see them die. You should give them a try, they'll surprise you with their output. I am glad to read that you enjoyed the orange bells - though I am not sure if I got even close to the same. :-) But I do have and orange bell planted. And I think I need to be on the look out for that particular cucumber.